Discussion in 'Creative General Discussion' started by Tigertrack, Jul 23, 2010. What would be a good set of hands to use on G1 Metroplex? I find my Encore Metroplex "fairly" articulated, but wish his hands could do more than just hold a gun. As the fists are snap in, I'm wondering if there is a set of hands somewhere with individual fingers that I can use for Metro? check gundam kets of the same scale. I would have no idea what scale of gundam kit's to use for G1 Metroplex. There are a lot of options @ hobbylink japan if you don't mind spending some dough. There are quite a few tutorials lying around too. I think there are at least 2 on this site about creating scratch built hands. One involves painstakingly cutting out the digits from styrene and putting pins in each joint. The other involves using flexible ball joints, but these don't quite close all the way when complete and they can pop off. You could combine the two ideas of course, or if you have patience anything can be sanded down to make a finger joint. I don't have the patients for all that custom building. Nor the skills. Would rather find something that I can build/paint and adapt. But, not scratch-build. Well I know that the guys that do the ROTF Leader Prime's, they use 1/100 Gundam hands, I think so don't hold me to that. So look at either 1/100 or 1/60 scale hands. 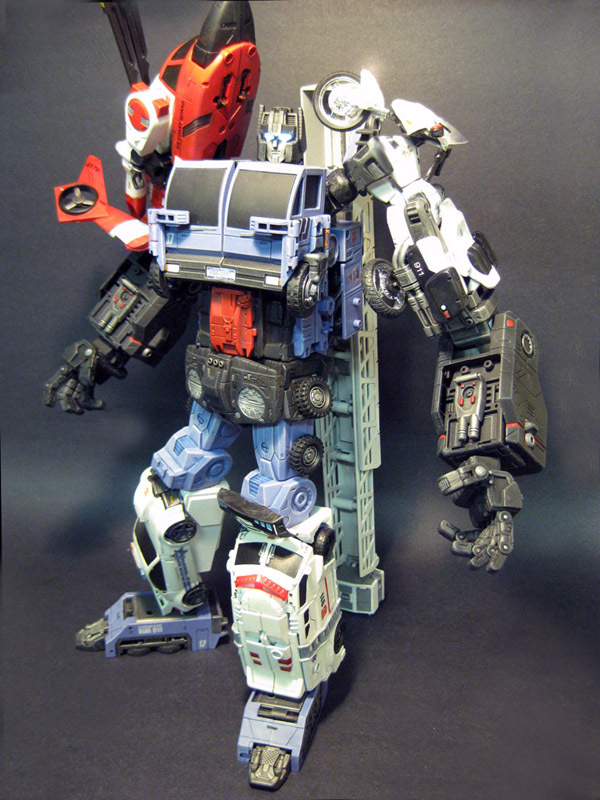 Remember, G1 Metroplex does have BIG hands. I think his hands are actually bigger than ROTF Prime's. Metro's hands are indeed bigger than RotF Prime's hands which use 1/60 scale Gundam hands. I would ALMOST say to use Cybertron Primus hands if you can.. Either that, or you may need to build you own. Hmm, everytime i see that kit i always wonder: Is there a right hand version of that? All i see is the left hand. I believe it can become both, I know payton used it for his MP Fort Max. how about the hands on Optimal Optimus? Looking for a set of hands that's closer to plug'n'play type. I don't want to build from scratch, I don't want to do heavy modifying. All I need is a set of articulated hands of right size that I can build and paint if it's in kit form, or make to snap into place. So, looking for something simple. And please, if you have a suggestion, pictures of the item would be helpfull. just remember you we need two model kits if u go with the anti tank squad set cuz it only has one hand(that can be bulit as left or right) i suggest painting b4 u put them together and keep close track of the part as u do so! That set is way to big for metro. Payton used this set on Fort Max who is at least 2x bigger than metro.. Honestly marcatron... You're going to have to modify a set or build then.. I'm sorry, but there isn't any other option that I can see. Now you could try the optimal optimus hands that dsn1014 suggested, or as I suggested, the primus hands. As I sad, Payton used those hands on Maximus, and he's almost 2' tall. Metroplex is MAYBE 10-12 at best? IF you were to go the route of using gundam hand, you'd need to use a 1/60 scale kit, not necessarily a perfect grade, but the problem with that is that Metro is so blocky, but the gundam hands are very stream lined and skinnier. I forget who said it, but some one mentioned the use of 1/60 scale gundam hands for Leader Prime figures that everyone uses, this is true, but that leader prime might be about the same in height, he's also more streamlined, and the hands fit the figures aesthetics where they'd look really out of place on Metroplex. Either modified Unicron or Primus hands I think are your best bet man. I mentioned the ROTF Prime using 1/60 scale hands. You can modify the gundam hands with styrene to make them more blocky, it's not that hard. the model is pretty intensive and intricate though, be ready to spend an hour or 2 just putting the hands together. How articulated are the fingers on Megamorphs hands? I like to be able to have my figures giving people the bird. Like MP Megatron and Prime. Sounds crazy, but I like that kind of articulation capabilities. I don't like how the Masterpiece seekers can just point and nothing else.